Therapeutic listening improves auditory processing, self-regulation, organizes the sensory systems and more. Building tolerance of tactile input. 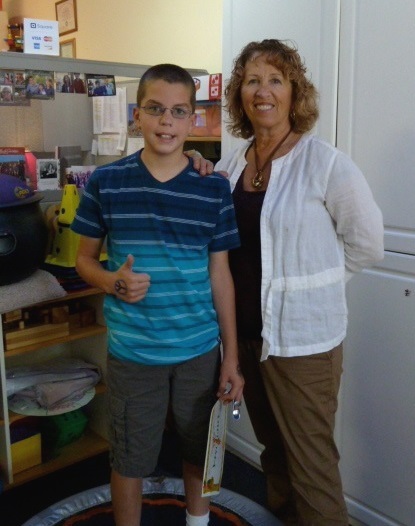 Here is Dillon, a recent graduate of New Directions for Kids. Dillon completed 8 years of therapy! An activity to build fine motor, hand skills, and imagination. Families and kids connect with other families and kids to receive support. Siblings can't wait to join in. We work with children of all ages to help them gain skills to function more optimally in daily childhood activities or their "occupations" of self-care, school and play. Climbing, jumping, balance activities, playing with textured-type materials, performing dressing, light hygiene, self-feeding and improving hand skills for handwriting and functional activities. An atmosphere of safety, optimism and respect, we help build the cognitive, motor and social skills children need to become confident and successful learners. We have fun while we learn! New Directions for Kids is an Occupational Therapy and Learning Resource Center in Arroyo Grande, California. New Directions for Kids serves children individually and in groups from infancy through adolescence. We are dedicated to providing a comprehensive Occupational Therapy program for young people with developmental delays, sensory processing disorders, or other learning challenges. We are located at 191 South Oak Park Blvd., Unit 9, Grover Beach, CA 93433. Please contact us for a consultation and to visit our facility. We can be reached at (805) 474-6811.